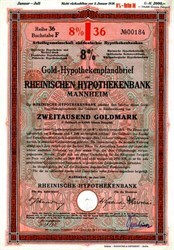 Beautifully engraved 8 % Gold-Hypothekenpfandbriefe certificate from the Rheinische Hypothekenbank issued between 1927 and 1930. This historic document was printed by Giesecke & Dierivnt, Berlin and has an ornate border around it with an elaborate underprint and watermarks. This item is hand signed and is over 77 years old. Eurohypo AG was created through the merger of RHEINHYP Rheinische Hypothekenbank AG, Deutsche Hyp Deutsche Hypothekenbank Frankfurt-Hamburg AG and Eurohypo Europ�ische Hypothekenbank der Deutschen Bank AG in 2002.